I was a camp counselor when I was in college. It seems like a different life time ago, but it was one of the best summers of my youth. Week after week we would get new campers. One night each week we would camp out under the stars and cook over a wood fire. The counselors would choose the meals for the time that we were camping out. 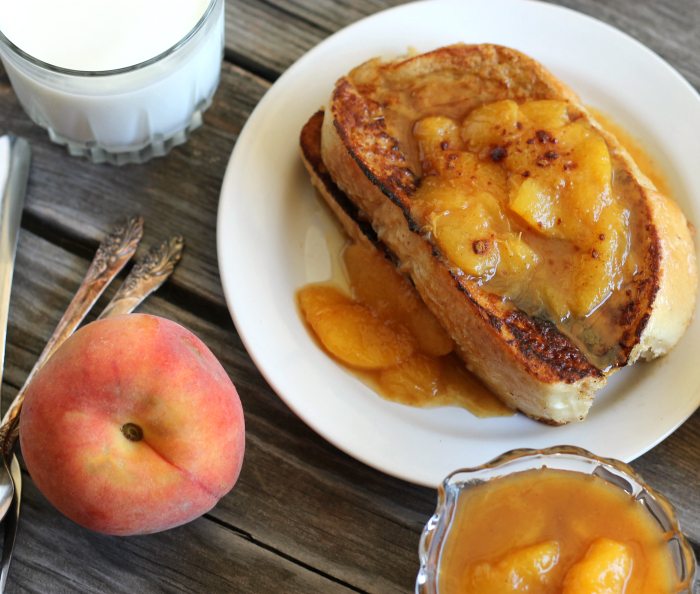 The breakfast that was picked most of the time, was a simple one; it was made of toast, canned peaches, and brown sugar. Thinking of the combination of ingredients now, it does not sound that fantastic, but it was so yummy. And as I mentioned it was the top picked breakfast of these camp outs. After all these years I can still remember enjoying that breakfast and of late I have wanting to recreate it. 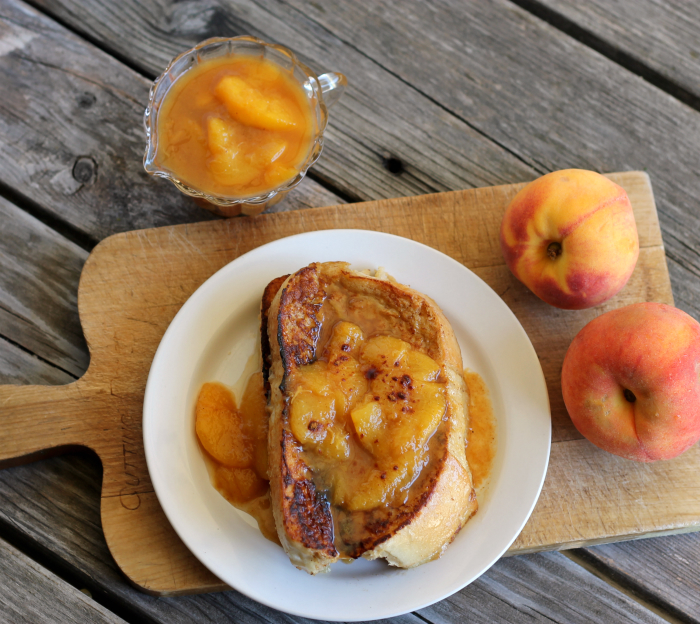 Instead of the toast I decided to substitute French toast and instead of the canned peaches I used fresh peaches. 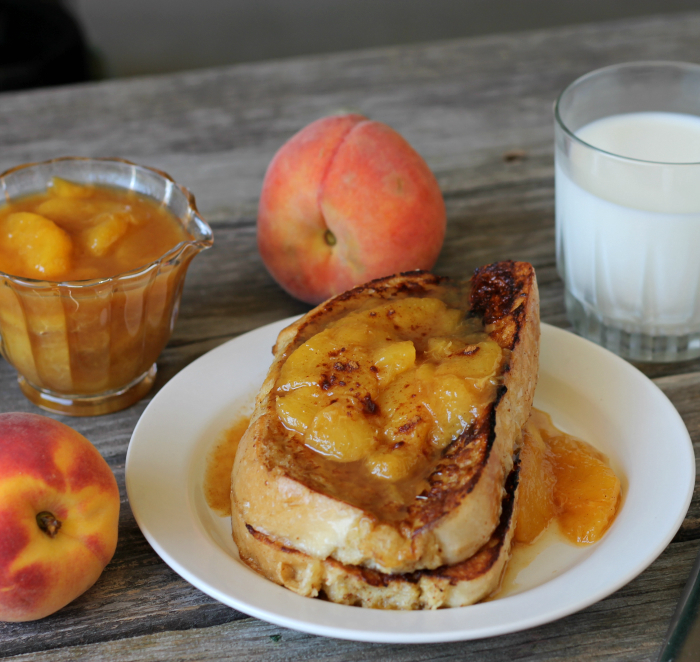 Sweet peaches topped over a French toast that is flavored with cinnamon and nutmeg can’t get much better than that. I made this for a Sunday morning brunch and I fell in love with this breakfast all over again. Yum, so delicious! Blend together the egg, milk, cinnamon, nutmeg, vanilla, and honey in a shallow dish. Dip the bread in the egg mixture making sure that each side is coated well. Melt butter in a skillet and brown each side of the French toast. Serve immediately. Slice peaches thinly and add them to a small sauce pan. Add the water, brown sugar, and cinnamon. Bring the mixture to a boil and reduce heat. Continue to cook until the peach have thickened and peaches are soft, about 8 to 10 minutes. Serve over French toast or it could be used for an ice cream topping. Well you’ve definitely inspired a French toast craving in me! And those peaches sound like the perfect topping. Oh, boy! I could eat that compote with a spoon! What a delicious breakfast! 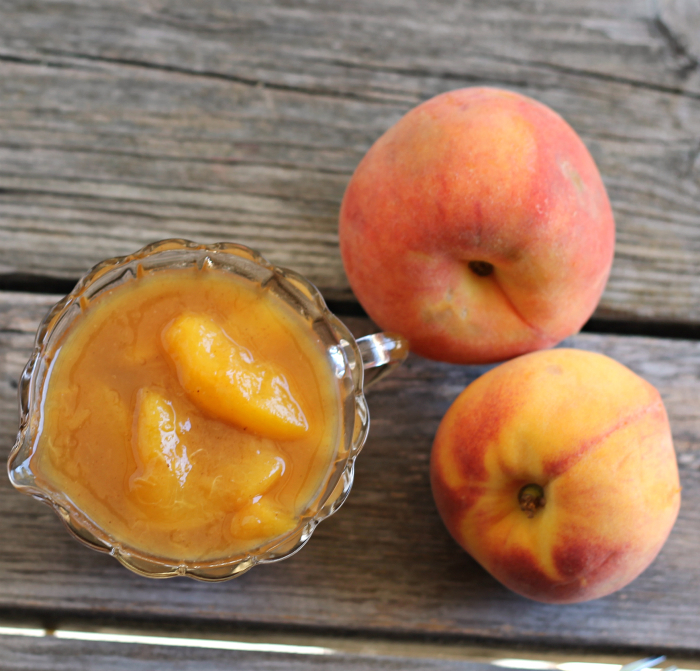 I need to make that peach compote!! This looks droolworthy, Dawn. Really fun story! And really fun dish — this looks fantastic. Suddenly, I have the urge to go camping. 🙂 Thanks for this.